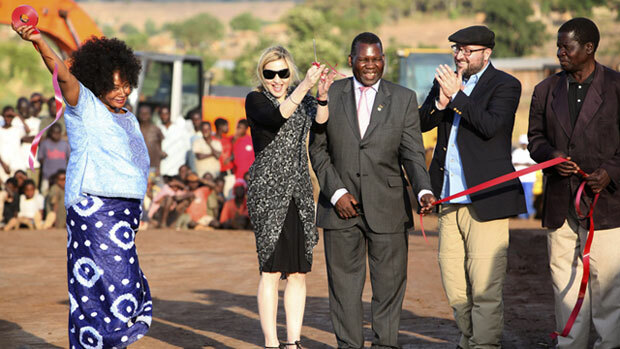 In 2009, Education Minister George Chaponda helped Madonna break ground for a $ US15 million ($ A14.5 million) academy for girls. Earlier this year, Madonna’s Raising Malawi foundation announced that instead of building the academy, it is providing $ US300,000 to the non-governmental organisation buildOn, which has years of experience in Malawi, to develop 10 schools. They’ll serve about 1000 boys and girls in the southern African nation of 15 million that is among the poorest in the world. But Trevor Neilson, who is helping to direct Madonna’s school project in Malawi as a partner of the Global Philanthropy Group, said allegations the government was being left out of Madonna’s planning are “absolutely not true”. “Our partnership with buildOn received the explicit approval from the education ministry. We had … six government officials who attended the contract signing along with about 50 or so members of the community,” he said. Neilson gave The Associated Press a copy of a January 31 letter sent to Chaponda. Days earlier, Madonna had released a public statement about her new plans. Neilson called himself Madonna’s adviser in his letter to Chaponda and referred to Raising Malawi having “changed course” on the academy. Neilson stressed Madonna remained committed to helping children in the country, taking a new “community based approach” by working with buildOn. Headman Binson Chinkhota had a tough time convincing villagers of the importance of Madonna’s academy project. Now, he feels let down. A leading child care group also expressed disappointment in Madonna and said its funding by Raising Malawi stopped suddenly and without explanation. “We are really struggling – they were our main funders. In fact, we increased the children we feed daily because of them,” said Lucy Chapomba, administrator at Consol Homes, a group that runs projects for orphans and vulnerable children in central Malawi. Neilson said Raising Malawi was funding Consol Homes through the middle of this year, but that Consol Homes was not fulfilling its financial reporting obligations and there were “major concerns” about the performance of its management team. “So, as of now, we’re not going to be continuing that funding unless they can show us that the money will be well used,” Neilson said.